Replacement Battery A1664 3.82v 7300mah UK for Apple iPad Pro 9.7"
Part Number: A1484. Apple internal battery for the iPad Air. Part: Apple iPad Air battery. iPad Air (A1474 / A1475 / A1476). Capacity: 8827mAh / 3.7v. We work very hard to ensure that your back up and running as quickly as possible, we understand that it may just be a phone or tablet but we are all pretty lost without them! 3.86v / 7300mAh / 27.89Wh. Compatible with: iPad Pro 9.7" A1584 and A1652. All Categories. We work very hard to ensure that your back up and running as quickly as possible, we understand that it may just be a phone or tablet but we are all pretty lost without them! 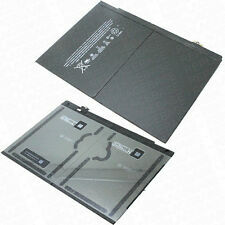 For Apple iPad 2 - Battery - OEM. Apple iPad 2 3G & Wi-Fi. Apple iPad 2 Wi-Fi. Capacity: 6500mAh. Should I replace the battery?. Modern Li-ion batteries have an average life of 12 months before the start declining in performance but can decline if performance much faster if not treated correctly. These are ACTUAL genuine batteries removed from iPad Pro's. Apple 4490mAh battery for the iPad Mini. Compatibility: Apple iPad Mini 1st Generation - All revisions. Apple Apple battery. Short circuit protection. Apple Part Number: 616-0687. We work very hard to ensure that your back up and running as quickly as possible, we understand that it may just be a phone or tablet but we are all pretty lost without them! Capacity : 6471mAh / 3.7v. Part Number: A1512. Part: Apple iPad Mini Battery. Apple iPad Mini 2nd generation. Apple iPad Mini 3rd generation. We work very hard to ensure that your back up and running as quickly as possible, we understand that it may just be a phone or tablet but we are all pretty lost without them! Capacity : 5124mAh / 3.82v. Part Number: A1546. Apple internal battery for the iPad Mini 4th generation. Part: Apple iPad Mini Battery. Apple iPad Mini 4th generation. We work very hard to ensure that your back up and running as quickly as possible, we understand that it may just be a phone or tablet but we are all pretty lost without them! Other Useful Information This is your responsibility. • Grade B: Average signs of use. Capacity: 11500mAh. Apple iPad 3 3G & Wi-Fi. Apple iPad 3 Wi-Fi. Apple iPad 4 4G / LTE and Wi-Fi. Apple iPad 4 Wi-Fi only. Apple Part Number: 616-0593 or compatible. Should I replace the battery?. Modern Li-ion batteries have an average life of 12 months before the start declining in performance but can decline if performance much faster if not treated correctly. Kapazität 6471mAh. Kompatible Produktlinie for A1512. Cd = battery contains more than 0,002 mass percent cadmium. Kompatible Produktlinie iPad mini 2. Pb = battery contains more than 0,004 mass percent lead. Info Replaces: 020-00297 A1546. Kompatible Produktlinie A1546. Battery battery battery for Apple iPad Mini 4 5100mAh spare battery ACCU. Capacity: 5100mAh. iPad mini 4. You are looking for an alternative to the expensive original batteries?. Compatible models: iPad Pro 10.5 A1701, A1709 A1852. Part Number: A1798, 020-01443. Numéro de pièce fabricant IPAD PRO 12.9. The preparation of your order will be carried out with care by our team in our office in France. IPad Mini 2 Logic Board. Original Apple Logic Board. Battery replace battery battery of for Apple iPad Pro 10.5 A1701 A1798 spare battery. Battery replace battery battery of for Apple iPad Pro 10.5 A1701 A1798 spare battery ACCU. Info Replaces: A1798. iPad Pro 10.5 2017. The battery is not punctured and is still in good condition. This would be great to have refurbished and sold as a genuine refurbished battery. Info replaced A1547. Kompatible Produktlinie A1547 A1566 A1567 iPad 6. Kompatible Produktlinie ersetzt: A1547. You are looking for an alternative to the expensive original batteries?. Then you are right here. For sale is my iPad mini 1st gen chassis / housing. No screen LCD, nor glass is included.